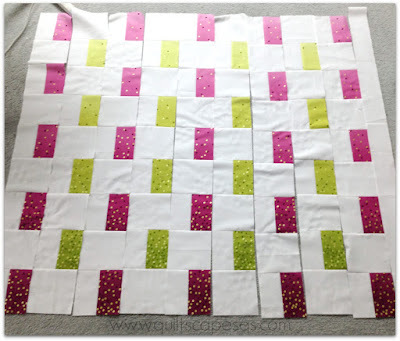 Last December my cute blog friend, Carla @ Creatin' in the Sticks set out to make 30 quick quilt blocks in 30 days, and featured the tutiorials and quilts on her blog. Sharing a daily dose of easy squares, it became so popular that Carla has created a blog hop for a few of her followers to showcase their favorites, and welcome to Day Nine! I loved the look of her Topsy-Turvy block. Her original layout seemed to make it look like a loose weave, which really appeals to me for some reason, and I promptly began to imagine a variety of colors and designs if I were to make one for myself. Here's a link to Carla's original TUTORIAL for this block. These blocks were so easy to sew and put together. I was especially excited to use some of my new V&Co Ombre Confetti Dot fabrics I picked up last Saturday. I used about 1/2 yard of the pink and 3/8 yard of the green, with 2 3/8 yard background. Once the fabrics were cut, I stitched all my color rectangles to background strips, then cut them apart and squared them up afterwards. And instead of making blocks like the original, I stitched the units together in vertical rows, so I could control the color placement. I loved not having to use pins until I was ready to stitch the rows together. Also, strategic pressing (to the dark side) made it so I could nestle the seams at every intersection. Love how the ombre' fabric fades to light at the top. In all, it took me exactly 4 hours and 26 minutes to cut out, sew and press to make this quilt top, which measures about 48" x 55", a perfect baby size or small lap quilt. I can't believe how quick and satisfying it was to make. Fun quilt block design, fun fabric, fun all around! Now, for the quilting.... How would you quilt it? Meanwhile, check in with Carla's blog HERE to see this hop's lineup and catch up on previous "30-Blocks/30-Days" projects. Or check her 30 Blocks Pinterest page for the entire collection! Happy Quilting! Cute! I like how the density of the dots increases as you move from top to bottom. Your quilt turned out very pretty. The colors and the fun ombre dots are awesome. Amazing! How quickly you've assembled a quilt! Way to go! What a great way to start the day. Love your fabric choices. They make for a very happy quilt, bright and cheery. Thanks for the tips on construction. Who doesn't like an under 5 hour project. All that negative space for some super fun quilting. 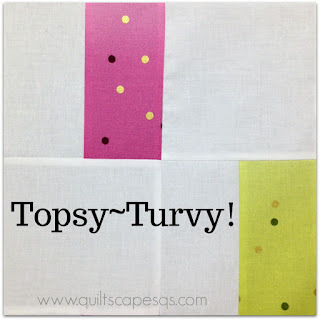 Love your Topsy Turvy Quilt and thank you for showing some superfast piercing ideas. You are a sweetheart to join in on this blog hop vision I had. 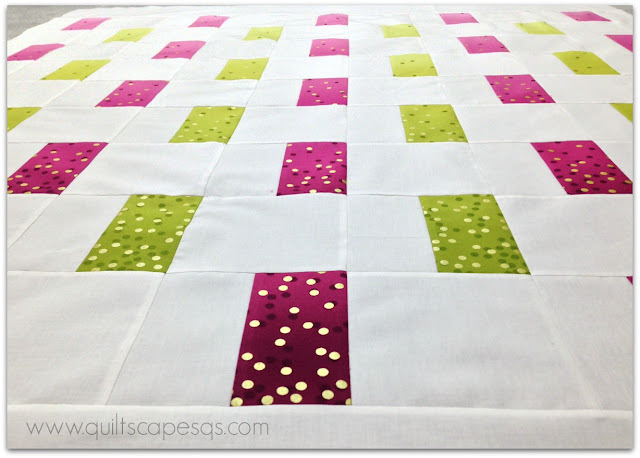 Great post and super fun quilt!! 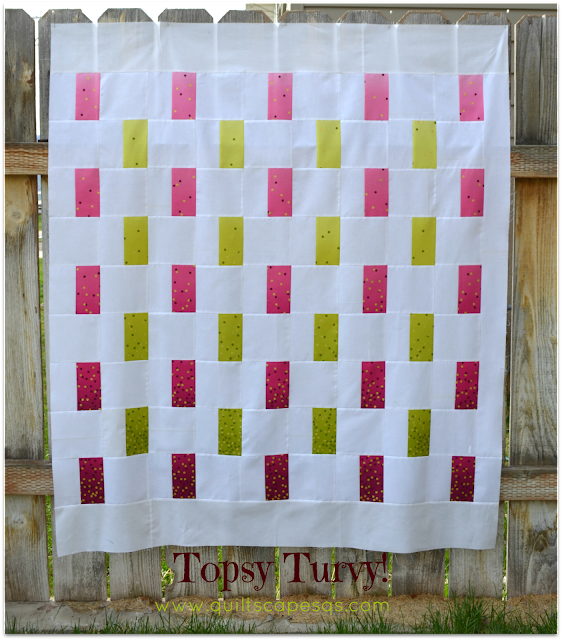 Eye-catching fabric and makes an adorable baby quilt. It is beautiful. I love the fabric you chose for it with the variety in color depth. Such a sweet quilt using that block and those fabrics...love it, Deonn! Wow! I'm impressed at how fast it went. It's perfect! That looks so cute with those fabrics - well done! Love the fabric you used. Super quick and easy quilt. Great fabric and great design! With all that negative space and beautiful straight lines, I might try some wavy lines or maybe clam shells?? It's so hard to choose quilting designs! Maybe even some feathers in the white space? So many choices for such a beautiful quilt! I love, love, LOVE the fabrics you chose for this block and how it finished up. What a cute, quick little quilt. I cannot wait to see how you quilt it! This block's name may be "Topsy Turvy", but it certainly seems very orderly to me. When I feel topsy turvy I wish I were in as straight-and narrow shape as this block! Super cute - the dot print is perfect for this! I love it! 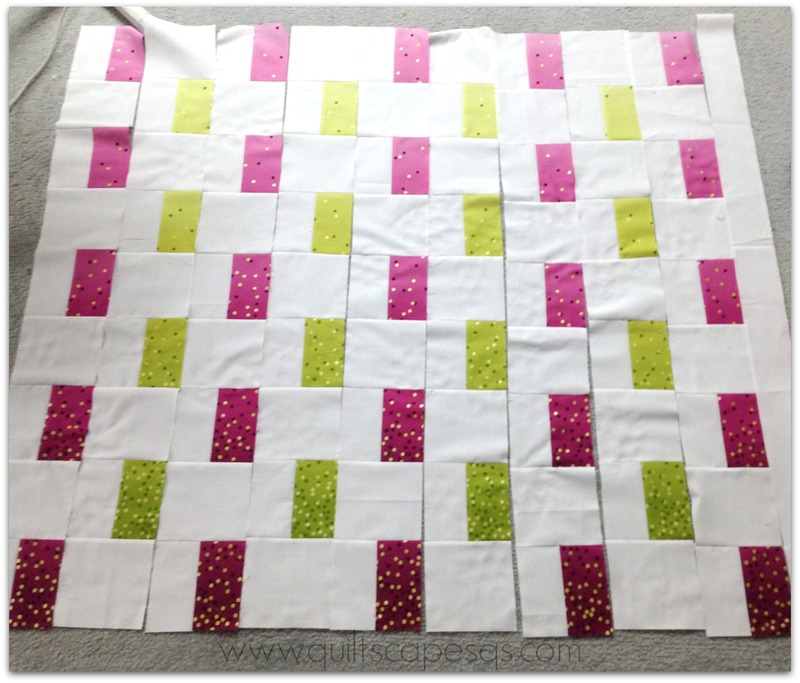 Great quilt for so simple a block! I like the way you put it together. It looks quick and easy the way you described it. Love your choice of fabric. I must get some ombre confetti dots. You say it is pink and green, but I see purple and green and I love that combination. Great job. Always fun to see another person's take on construction. Love love love your quilt! Cute fabrics. I love fast and easy. What a fun quilt! I can't recommend what way to quilt your lovely quilt. I am a beginner and just sew straight lines. Your quilt is stunning and a perfect example of a modern quilt. The ombre effect really adds interest. I too enjoy a good quick quilt occasionally. Really gives that sense of accomplishent. 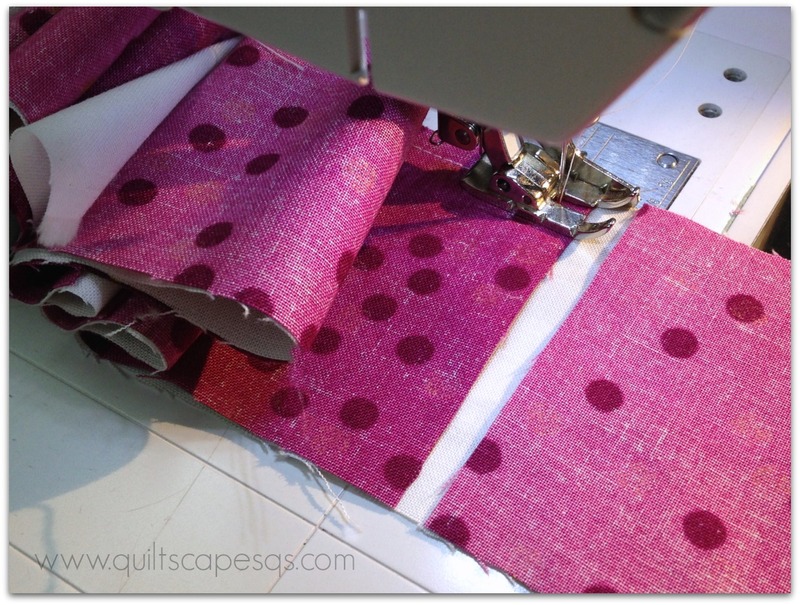 A curly quilting pattern to off set all the straight edges would look really good as would bubbles to bring out the dots! Thanks for sharing. Love your color choices! This made for a dynamic quilt. This simple designs is so fresh and screams spring is finally here! LOVE it!